My most recent experience with vocal impact comes from the world of Quarterly Earnings Calls. Does voice really matter? A certain CEO I work with thinks so. Having listened at his request to a recent call I immediately recognized that one of his leadership team was dropping the vocal ball. While his content was perfectly acceptable, his ability to land his ideas was not. Tip – When reading from a script into a microphone, perform “as if” there are living human beings in front of you worthy of your engagement. You must look up, speak to them and check for understanding as you engage. This presenter put colleagues across the table (I recommend you stand) and reached out and grabbed his audience with his vocal choices. His voice went from monotone and un-engaging to animated and persuasive. He projected more authority and confidence. Looking for a presentation panache break through? A recent client (call him Randy) proves that if you change your voice you can change your presentation. Using the tools described in my Change Your Voice, Change Your Life video series, Randy took a solid but somewhat somber presentation and turned it into a barn burner. By practicing the opening and close of his presentation for vocal variety – pitch, volume, rate, and inflection – Randy unleashed the passion, created more drama and transformed his power of persuasion. 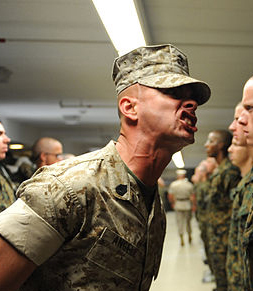 Exaggerate your speech, contort your face, run through your speech once like a drill sergeant — see what happens! Tip – Next time you have a high stakes presentation invest one rehearsal in vocal discovery. Rehearse the open and close as a Baptist Preacher, a Drill Sergeant, a Shakespearean Actor, or as Mystery Theater. The vocal extremes you discover will surprise you and many of your choices will find their way into your final performance. For vocal workouts and performance tips check out our YouTube channel here. Nice article! Thank you for sharing. I have learned a lot. Thank you again.